So the day began with the usual routine up for 630am 😦 breakfast which has now become a routine of porridge ( varying quality) scrambled egg and mushrooms as trying to avoid salty food which would make me thirsty . It’s then back to the room powder ones nose, fill the water bottles , shoes on then bags down into the van and wait until the 7 of us are ready and off we go generally leaving by 8am . Normally at a crazy speed for the 1st hour as enthusiasm gets the better of us . We then tend to wisen up and become a group of 4 for the remainder of the day . Liam who is suffering with his knee , Glenn who is having Achilles issues and Clem who is a machine . He has in built cruise control and will sit at any speed for any length of time ……….. An amazing machine we call him the Cleminator !!! Once again we are blessed with the weather for what is a fast and flat day along the A38 towards Bristol before we headed right towards Cheddar . I have ridden many miles around This area and they are fantastic quiet fast roads so really enjoyed us all flying along in a line taking turns at the front ……. Cracking stuff . As always just when your getting into the swing of it comes a huge hill . Shapham hill to the south of Cheddar Gorge .Not only was This steep it meant dicing with death with the amount of quarry lorries struggling up. Our reward at the top was another Discover Adventure lunch mmmm yummy . The afternoon brought us flying along towards Bristol on a cycle path alongside the M5 . Whilst Riding across the huge flyover we heard what sounded like a gun shot expecting to be taken out by a sniper we were more than happy to realise it was my back tyre that had punctured phew !!! Tube changed with the help of my wingman Glenn and onward towards the Severn Bridge via what must be the most awful busiest lorry jammed road by the docks …… Scary stuff. 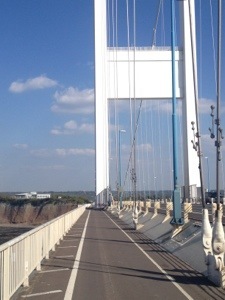 Eventually making our way to the Severn Bridge which we decided was the older one of the two bridges we stopped for a few pics and entered Wales. 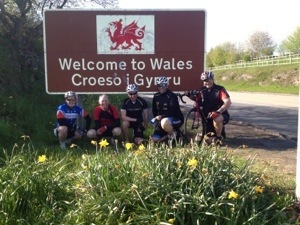 Once in Wales we got lost !!! Incredibly this involved having to climb an 11% hill to retrace our steps …… Not a happy feeling but worth it when we arrived at our stunning hotel in Chepstow for a well earned pint of cider . Ps what’s the difference between clotted cream and ice cream ?? Apparently if your a northerner you can’t distinguish between the two !!! Note to any northerners reading: devoners as we will call them are tricky bas***s , if you find yourself in the position that they have tricked you into thinking clotted cream was ice cream, look at them in disgust, refuse to eat it then walk away but under no circumstances turn around when you realise you haven’t now got any desert. Wait until you’re in Preston before you slag them off though, br among friends!